Tomorrow marks the one-month anniversary of the tragic death of beloved actress Carrie Fisher, who passed after suffering a heart attack at the age of 60. To honor the late actress, Empire has brought in a number of the actress' closest friends as part of a 24-page farewell in their March 2017 issue, which goes on sale today. The publication released an excerpt from this touching tribute, written by the late actress' former fiancee, comedy legend Dan Aykroyd. 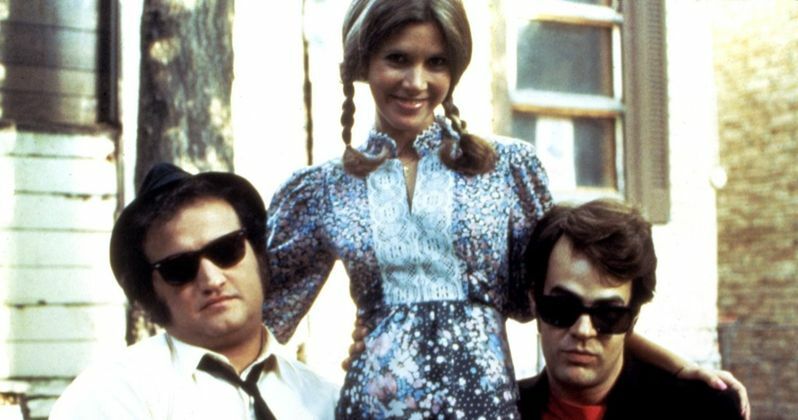 Empire released this excerpt before the issue went on sale, where Dan Aykroyd opened up about his relationship with Carrie Fisher, revealing how it was a "privelege and honour" to even know Carrie Fisher, having grown up "a simple Catholic kid from a government family in Hull, Quebec." Here's what he had to say about this "one-off, broke-the-mould woman," and how they first met and fell in love. "I met Carrie at Saturday Night Live. She and John Belushi became instant pals. I remember how much she made him laugh. Later, while filming Blues Brothers, Carrie and I fell in love and during the shoot she moved in with me into a penthouse suite in the futuristic, aluminium-clad Astro Tower, which I knew to apologize for. Carrie had the most refined eye for art and design. While in Chicago we obtained blood tests for compatibility from an East Indian female doctor. Contemplating marriage, I gave Carrie a sapphire ring and subsequently in the romance she gave me a Donald Roller Wilson oil painting of a monkey in a blue dress next to a tiny floating pencil, which I kept for years until it began to frighten my children. One of the most brilliant and hilarious minds of our eon, Carrie would say things like: 'I love tiny babies. When they cry they turn red and look like screaming tomatoes.' OR 'This romance is finished the second you let out even a threep. I'll be sick for a year.' AND ;You have a jawline, hold your chin up otherwise you look like a tuna." From then on I would identify myself on the phone as Tuna Neck." The actor went on to add how he was embraced by her family and the Hollywood community, and how her mother, Debbie Reynolds, who passed just days after her daughter last month, would cook for the couple. He also added how her brother Todd would take him on "high-intensity cruises" in muscle cars and on motorcycles with young Hollywood elite such as Jose Ferrer and Donna Ebsen. Here's what he had to say about a weekend retreat in Lake Tahoe, and how their relationship came to an end. "Before Christmas one weekend Carrie asked Debbie to call Harrah's security to arrange for her daughter and I to have a private weekend in a guest house on Bill Harrah's legendary Lake Tahoe estate. At this point our love was soaring on laugh-filled exhilaration and a vibrant, wholly satisfying physical intimacy. Having obtained some original Owsley from our friend Tom Davis, we flew up to Reno, rented a wagon and checked in for three days of full-on weeping to Christmas classics. Certainly one of the planet's greatest occasions where LSD was a factor. The romantic relationship ended the weekend of our final evacuation from Chicago by Lear 24 with Judy and John Belushi to our homes in Martha's Vineyard. It was night. Judy and John went home. Carrie and I went home to a house which Judy had purchased for me but unseen by me until the moment of our arrival. It was a fixer-upper, mid-century oil-guzzler, albeit designed by Hideo Sasaki. Carrie said, 'It looks like it was abandoned by Fred and Wilma Flintstone.' The next morning she asked me to drive her to the airport and she flew to New York. Architectural reservations notwithstanding, Carrie wasn't shallow, we had a great time. She was also in love with Paul Simon. She married him but I hope she kept my ring." Carrie Fisher married Paul Simon in the summer of 1983, but they both divorced a year later. She never married again, but she had her only child, Billie Lourd, with talent agent Bryan Lourd during their longtime relationship. Both Carrie Fisher and her mother were celebrated in the recent HBO documentary Bright Lights, which was moved up from its previously-announced March release to January 7, to honor the late mother and daughter.